Flybmi is based in the East Midlands and flies to 25 European cities. Passengers stranded across Europe have told of their frustration after the UK regional airline Flybmi collapsed, cancelling all its flights. The airline, which flew to 25 cities, said Brexit uncertainty and rises in fuel and carbon costs led to it filing for administration on Saturday. One Briton stuck in Belgium said the airline would not refund her fare and she could not afford an alternative. 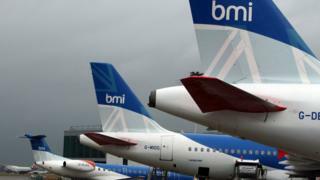 Flybmi’s move puts 376 jobs at risk and comes as other airlines face problems. The airline has told affected travellers to contact their insurance and credit card companies. Flybmi, which is based near East Midlands Airport, operated 17 aircraft. Durham University student Mary Ward discovered her flight could be affected when her mother showed her a news report. Ms Ward had been set to fly from Brussels to Newcastle but is unsure how she will return to the UK. “I paid £130 for my flight which it doesn’t seem I’m going to get back – I don’t know how I am going to get back to Durham,” she said. Richard Edwards, from West Sussex, said he and his family experienced problems with a scheduled flight to Munich when travelling to Austria for a skiing holiday. “We had gone through security at Bristol Airport when there was an announcement saying our flight had been cancelled,” he said. “They laid on taxis to Heathrow and booked us on a Lufthansa flight to Munich. Rory Boland, travel editor for consumer body Which?, said some customers had claimed tickets were being sold in the hours before the airline filed for administration, “knowing full well those tickets would never be honoured”. “Passengers will rightly be outraged if this is proved to be the case,” he added. A Flybmi spokesman said: “It is with a heavy heart that we have made this unavoidable announcement. One of Flybmi’s routes, which connected Stansted and Londonderry, was subsidised by the government to boost trade and travel between Northern Ireland and the rest of the UK. Several people use the flights for work and Derry Strabane Council said it was in emergency talks with the Department of Transport to seek a replacement airline for the route. British Airline Pilots’ Association (Balpa) general secretary Brian Strutton said: “The collapse of Flybmi is devastating news for all employees. Several airlines have folded or reported financial trouble during the past two years, with analysts blaming fierce competition, rising costs and falling passenger numbers. Britain’s Monarch collapsed in October 2017, while Germany’s Germania filed for insolvency earlier this month. Air Berlin and Alitalia, and a string of smaller operators hit trouble. Ryanair boss Michael O’Leary warned this month that the airline industry would see more bankruptcies. Flybe, another UK airline, has said that if a rescue takeover by Virgin Atlantic is not approved by shareholders, the airline will shut. Flybe has been forced to reassure customers on social media that it is “not associated with Flybmi” after concerns were raised by some passengers. Analyst Peter Morris, of the aviation consultancy Ascend, said the start of the year is always the worst time for airlines as they struggle to get through the winter and wait for a summer pick-up in bookings. But he was in no doubt that Brexit uncertainty and questions around freedom of movement beyond 29 March would have hurt Flybmi. There are issues around the regulatory status of UK airlines after Britain leaves the EU. Travel expert Simon Calder told BBC News it had been an “extremely difficult winter” for many airlines. Flybmi’s operations were formerly run as BMI Regional, a division of the airline BMI. The company was formed in 2012 when British Airways owner IAG took over BMI and sold the subsidiary. The airline last year ran 29,000 flights carrying 522,000 passengers. Flying from Aberdeen, Derry, Bristol, the East Midlands, Stansted and Newcastle in the UK, its planes travelled to destinations in the Czech Republic, Denmark, France, Germany, Italy, Norway, Poland and Sweden. A spokesman for the Department for Transport described the situation as “very disappointing” and said the government was focused on supporting affected passengers.